Wow - summer is over, come and gone almost before we knew it! Posting for me, has been a bit of an elusive thing over the last month or 2 - mostly because I have FINALLY decided it is time to get my life together, and have taken time off from blogging to get started! Are you like me? You long to have a "together life" - for your house to sparkle, have everything crossed off your to-do list, and nothing hanging over your head? I know, I know...I've said it all before! And I've tried, I have...I've done the Flylady thing a time or two...and I think it's a great system - it just doesn't work for me. In the past - I've always assumed that it was my fault...I just couldn't "do it right"...I have finally realized that there is nothing wrong with that system or me - it just doesn't work for me!! Ladies and gents - that has been a huge revelation for me! My husband and I run a construction business from our home - I'm a stay-at-home/work-at-home/constantly has something to do Mama! I have an adorable almost 2 year old who clamors for my attention...paperwork galore from our business and then I jumped into Etsy. My husband and I both have a never-ending to-do list and more to do than any one person should have on their plate! For the past few weeks & months, we've been investigating how to establish systems in our lives that make everything easier. I have always longed to be organized and never can quite seem to get there - until now. I truly believe that my journey has begun! My big tip for the week, while simple, has truly revolutionized my life these past weeks. Simple - I know - but this simple axiom from David Allen of Getting Things Done fame has made a huge impact on me! (More from him later, as he has been a big help in this undertaking.) Back to the 2 minute idea, what I have come to understand is that as a master of procrastination, I let far too many things lie around waiting to be done at the "perfect time" on the "perfect day" neither of which ever happen in my life. By utilizing the 2 minute principle, I am knocking little things out one at a time that then leave me both encouraged and with bigger blocks of time to deal with the bigger stuff! but no fear...I know it is all going to come together this time - I am encouraged! 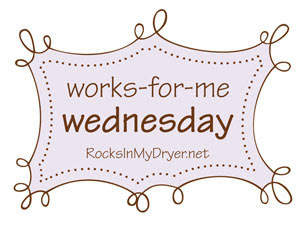 Thanks so much for joining me today for WFMW - for more great ideas, head over to Shannon's to link up with lots more folks! And I hope you'll come back to share in this journey with me...rest assured, I've got a long way to go, but for the first time ever, feel like I've found the tools to help me make it happen - to get my life together so that I can spend time on things I really value...now that works for me!